Bumble has made experiential marketing a core part of its strategy to expand its user base. Last year, the company launched a series of roving pop-up spaces that debuted in New York City and has since made stops in London, Los Angeles, and Vancouver. Earlier this year, Bumble teamed up with HBO on a "Stay Home To The Movies" activation set in a New York City brownstone that aimed to recreate the experience of a romantic night in. Bumble’s latest move to bring the dating experience offline is a partnership with Marriott International's Moxy Hotels. 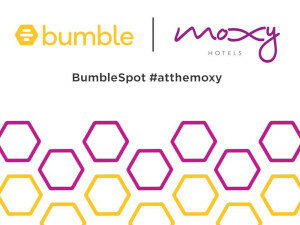 Certain Moxy locations will host "BumbleSpot #attheMoxy” events where Bumble users can bring their connections from the digital sphere to real life. BumbleSpots are places that have been verified by Bumble as inclusive environments in which to meet connections from Bumble’s dating, friendship and professional networking services. Bumble users and Moxy guests are treated to a number perks when visiting BumbleSpots, including food discounts and a custom drink menu for those who show the Bumble app on their phone while ordering, as well as access to Bumble’s Profile Doctors and workshops with Upright Citizens Brigade. Moxy’s work spaces will be made available to Bumble Bizz users who need a place to work on the go, and the hotel’s regular bar programming will be updated with fun twists designed to break the ice and encourage connections. BumbleSpot #attheMoxy launched in New York City at the new Moxy Hotel in the Financial District on November 13th. Events followed in Chicago and Denver, with events planned for Moxy locations in Seattle, New Orleans, Tempe, New York Times Square, and Minneapolis through the end of 2018. Moxy is Bumble's first nationwide BumbleSpot partner. More BumbleSpot locations will launch across the United States and Canada over the next year.